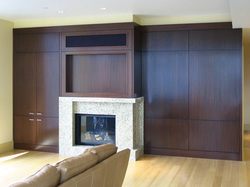 Most of the cabinets I build are more like furniture than like the cabinets normally seen in an average home. I guess it is just handmade furniture that is permenantly attached to the house. 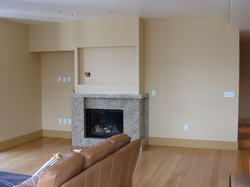 Fireplace wall prior to installing paneling, cabinets and opening for TV above fireplace. Same wall after installing new woodwork which was made to match the other cabinets in this condiminium. New TV for space above fireplace was not installed yet.